Fungie - Dingle's Dolphin, But Not a "Wild Animal"
Fungie (sometimes also spelled Fungi) is an Irish institution, a national treasure, and a big pull for the tourism industry. 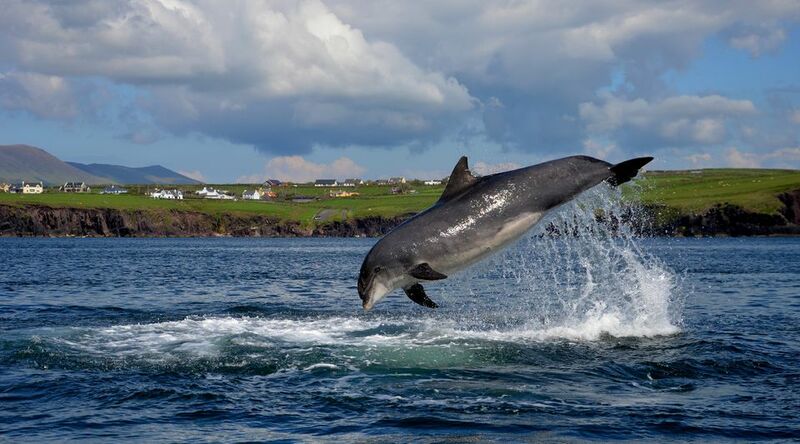 If you are visiting Ireland and want to have a good chance to see a dolphin "in the wild", most people will guide you towards Dingle in County Kerry. As Dingle Bay is home to Fungie, a solitary dolphin known for interacting with humans. And for single-flippered-ly kick-starting a whole industry. Unfortunately, the dolphin's behavior is not natural and a large amount of activities centering on the one animal seems to be too much at times. True, here is a chance to interact with a "wild" dolphin - beats all the interaction experiences provided by theme parks and zoos (which are becoming rarer anyway). But is it real? Actually, Fungie can by no stretch of the imagination be considered "wild" these days. He is used to human company and actively seems to seek it out, and the theme park atmosphere when tour boats crowd the animal (though everyone swears they do it with utmost respect and consideration) does not make for easy viewing at times. A solitary bottlenose dolphin decided to settle in Dingle Bay for unknown reasons around 1984, he was soon dubbed "Fungie". Soon numerous dolphin-related activities were (and still are) on offer, and kids can now even sit on a dolphin-statue before buying dolphin dolls - in short, Dingle's tourism industry has become very, some say almost totally, Fungie-dependent. Is Fungie Worth Your While? Fungie is a Dingle attraction in his own right, so you'll be hard-pressed to avoid him - ever since the dolphin appeared in Dingle Bay more and more dolphin-related activities, shops, and souvenirs have surfaced. Cynics already say that the death of Fungie would kill off a large part of Dingle's income from tourism as well. This might be the reason why criticism of the "Fungie-Industry" is not very welcome in the small Kerry town. Also not very welcome is mentioning the fact that Fungie is still described as a "young dolphin" by many locals ("young" standing for "playful"), despite the fact that he first appeared in 1984 and that the average lifespan of a Bottlenose Dolphin seems to be around 25 years. Even with some making it over 50, Fungie by now is well into a middle or even old age. The (to some ugly) truth is that the widely promoted encounters with a "wild dolphin" in Dingle are not very dissimilar to organized activities in Florida's theme parks. And Fungie's general behavior has led some marine biologists to conclude that he is not a wild but probably an escaped animal. Fungie-fans, on the other hand, declare with an almost religious fervour that he is the "real thing", that he was never forced to perform, and that no-one means him harm. Observing several boats circling in the bay, each trying to to get as near to Fungie as possible, one gets the feeling that all this cannot be pure fun for him. Then again, what do we land mammals know ... though Fungie was injured during a close encounter with a boat's propeller in 2016. Are the trips and activities worth it? It depends - there always is a chance of a close encounter, but never a guarantee. Another option would be to hike up Ballymacadoyle Hill to the curious marker and enjoy the view ... with the chance to spot Fungie for free. Or even really wild marine mammals passing by, whale watching takes patience, though. Fungie-mania has led to many people seeing those marine mammals as man's best friend in an aquatic environment, always happy, always nice - Flipper in Irish, so to say. And this has led people, from the great public to self-appointed "dolphin whisperers", to the conclusion that nothing can go wrong here. Unfortunately, this is a very wrong conclusion. Dolphins are wild animals, not pets, and their friendly (or at least indifferent) social behavior often displayed during contact with humans may take a change for the worse in a second. If the dolphin does not initiate contact by itself, forcing yourself into its personal space could lead to a "flight or fight" reflex. And in the water, you are always at a disadvantage. In recent years, dolphin attacks on over-enthusiastic swimmers have led to several hospitalizations of the two-legged species in the encounter. Dolphins are very adapt at ramming humans in the groin with the speed and devastating impact of a torpedo (at least it feels like that). So ... leave them alone! What's the best rollercoaster near Seattle?